In fact, that's why we go to the games rather than watch them on TV. You see a lot more of what happens in a football game because your eyes can take in a heck of a lot more than the TV cameras can. Unless, of course, you're standing in the 6th row between the five and ten yard line and you have these towel swingers in front of you. Even without the towels, from that low angle you can only see clearly until about the 35-yard line on your side of the field. After that, your depth perception becomes very distorted. What looks like a five-yard run can actually be fifteen yards. You can't see sideline pass catches. It's hard to follow the ball. So...when the team was playing on the other side of the field, we just sat down, enjoyed the rest, and watched it on the Jumbotron. It was just easier. It always confounds us why people like low seats. We much prefer higher seats, where we can see the entire field. And we can sit through the entire game. Sorry, but we're not exactly young anymore. On the other hand, when the Penn State team was in the Red Zone in front of us, it was a lot of fun, and you could catch all the action up close. Even if you had to stand. 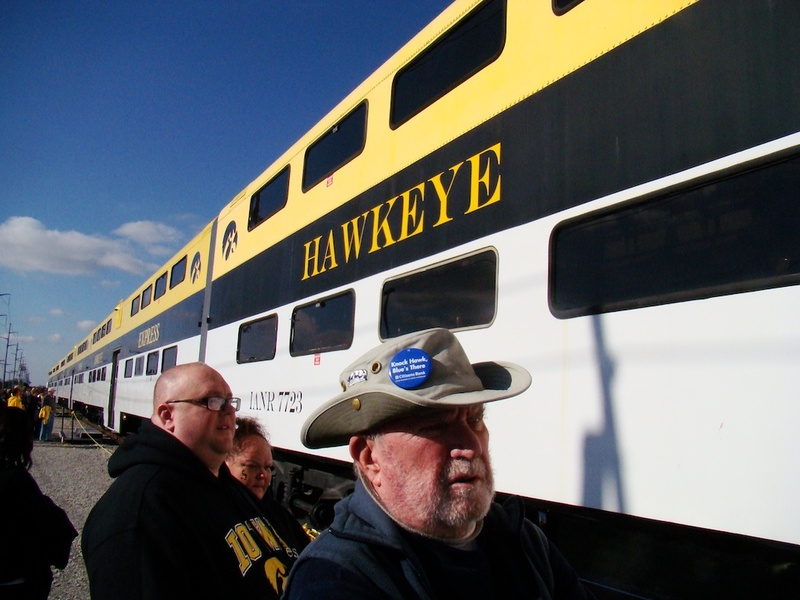 But let me back up, because I do need to also acknowledge one other thing about the Iowa fans we encountered: numerous fans approached us, welcomed us to the Hawkeye Express or to Kinnick Stadium, and wished us well. Several expressed real sympathy and sorrow for what has happened at Penn State over the past year as a result of the Sandusky criminal activity, and many also expressed a desire that Penn State recover quickly from the losses it has already encountered, and will continue to encounter, as a result of the NCAA sanctions. Admiration for Coach Bill O'Brien was also expressed numerous times. And that felt good. Because Iowa has become quite a fierce rival, and we had some negative experiences in 2010, the last time we visited Kinnick Stadium, with just a few fans that made us wonder what it would be like this year. Add to that the fact that we would be riding to and from the game on the Hawkeye Express from Coralville, and we were a bit fearful about how the Sandusky scandal would impact our experience at Iowa. The student-run blog Onward State showed a photo from the Iowa game with five individuals wearing prison stripes with the name J. Sandusky on their shirts. You can see it here if you choose. What I would like to express to all who view that photo is that those few tasteless individuals were only five of the 70,000+ fans present, and NOT representative of the majority of Iowa fans we met that day. The fans we met offered us beer, brats, seats at their tailgates, and expressed their desire that we be treated very well (as long as we didn't win the game). And even after the game, the fans who stuck around until the end of the game and rode with us on the Hawkeye Express congratulated us as we entered the train and expressed how much they admired how the game was coached. In fact, my husband Terry and I can't agree more. We are very impressed right now with what Coach Bill O'Brien and his cadre of assistant coaches have done with this team. But more importantly, we are impressed with what this team has done. In the midst of all the adversity confronting Penn State football, and despite the losses of seventeen scholarship players, many of whom who were key players involved in spring practice, the players who stayed have adjusted to so many things. These players have adjusted to a new coaching system, to a brand new language on positions and play calls, and to a fast-paced game that is confounding every coach that Penn State plays. These Penn State players have overcome weaknesses or adversity in the last five games and found a way to win. They have done a tremendous job and their motivation is what is causing us all to realize that Penn State football is not only still a great deal of fun, it's the best sort of fun because it surprises and delights every week. We don't really know what to expect, but we know that this team will try its best to win. It's no small feat to not only win at Kinnick Stadium, but to DOMINATE Iowa at night in front of an amazing home crowd. We were all expecting a close game. It wasn't. So to fans we say, let's get out and support this team. Not only this weekend against Ohio State, where it's a given that the stadium will be full. Plan now to be there on November 17 when it gets pretty cold, and we play Indiana, a team that could surprise us, given their close game against Ohio State. You - we - are needed in the stands. Plan to be there on November 24, the Saturday after Thanksgiving. Against Wisconsin. It's a game that could determine the Leaders Division championship, for which Penn State is a contender. Get ready now to don your cold garb and get your butts in the seats for this team's final game. There are tickets available. Buy them! 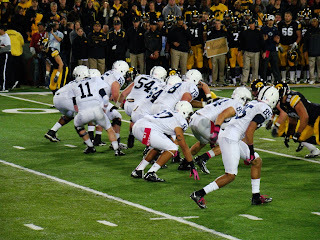 Go to gopsusports.com now and buy them at face value directly from Penn State. You don't have to go to scalpers to get good seats. Be there to support this team! They are a special group of guys who deserve our support. Visit my blog at www.viewfromstands.blogspot.com for more photos from the Penn State-Iowa game and other features on the website.